During the lead up to my birthday this year, my husband and I went back and forth as to where to go and enjoy a nice birthday meal. Then, one evening, a week before my birthday, he suggested that we go to an earlier dinner at a restaurant in Santa Monica that we had both talked about wanting to try for about a year now. It just so happened that my husband was off at a seminar that day, and he’d be done with his seminar earlier than normal, so he’d be able to make an earlier dinner if I could swing it as well. 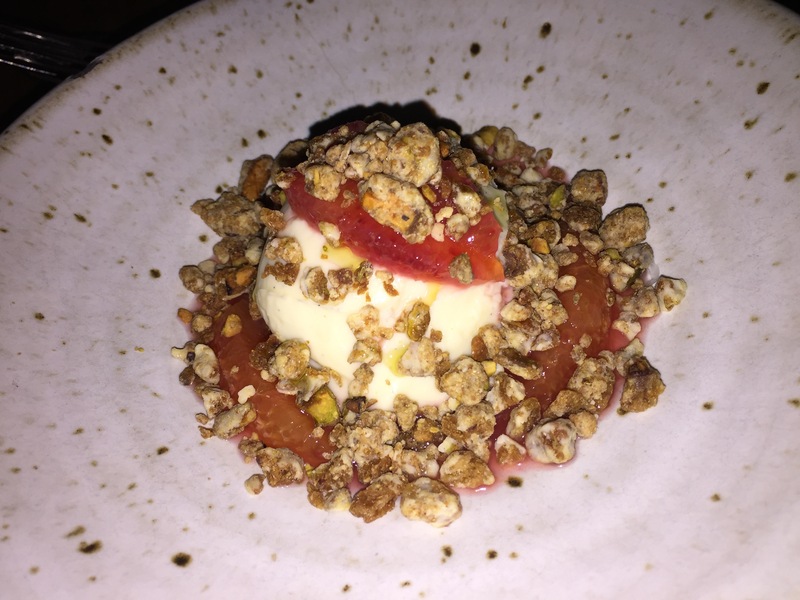 One of the reasons that this restaurant had made it back on our radar was that we had recently seen a list of the hottest restaurants in LA for Winter 2016 and this particular restaurant, despite having been around for years, was at the top of the list. There must be something that keeps people coming back multiple times and the food must be good enough that it’s always atop critics lists. It’s about time my husband and I found out for ourselves what it is about this restaurant. 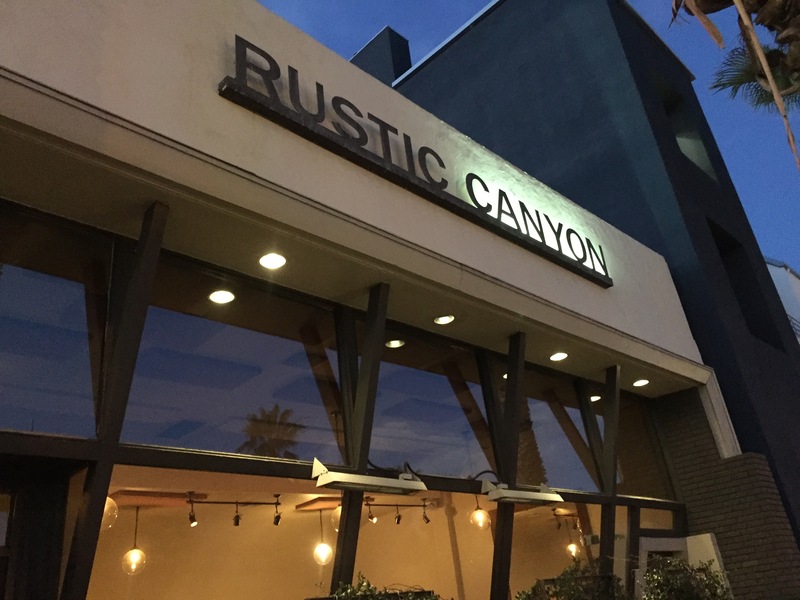 Rustic Canyon Winebar and Seasonal Kitchen was the first restaurant in the Rustic Canyon Family of Restaurants that includes Sweet Rose Creamery and Milo & Olive, among other restaurants that have taken over Santa Monica. The idea of this upscale, California fresh cuisine came from founder Josh Loeb who would host intimate dinner parties at his house in the Rustic Canyon neighborhood of Santa Monica. At these dinners, friends would gather around a long, candlelit table, tell stories, share good food and wine and make new friends. And that is the idea that inspired the creation of the menu of the restaurant as well as the interior decor of the restaurant. A small, intimate gathering place that is simple, elegant and understated to create a cozy, warm environment where friends and family can gather together to feast over fresh, farmer’s market fare created from simple, local ingredients and a selection of some of the best wines, hand crafted cocktails and artisanal beers that you can find in the marketplace. Since Rustic Canyon is known to have some terrific cocktails, my husband decided to give a couple of different cocktails a try. His first drink was the Angeleno made with Redemption rye, Aixa Vino vermouth, Grand Poppy liqueur and Scrappy’s orange bitters. 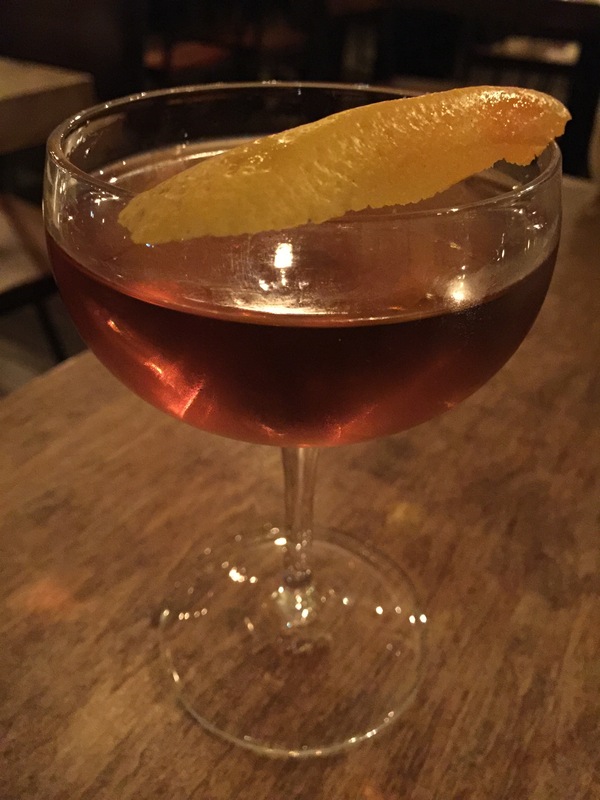 This drink was a bit of a play off of a traditional Old Fashioned, which is my husband’s favorite cocktail. 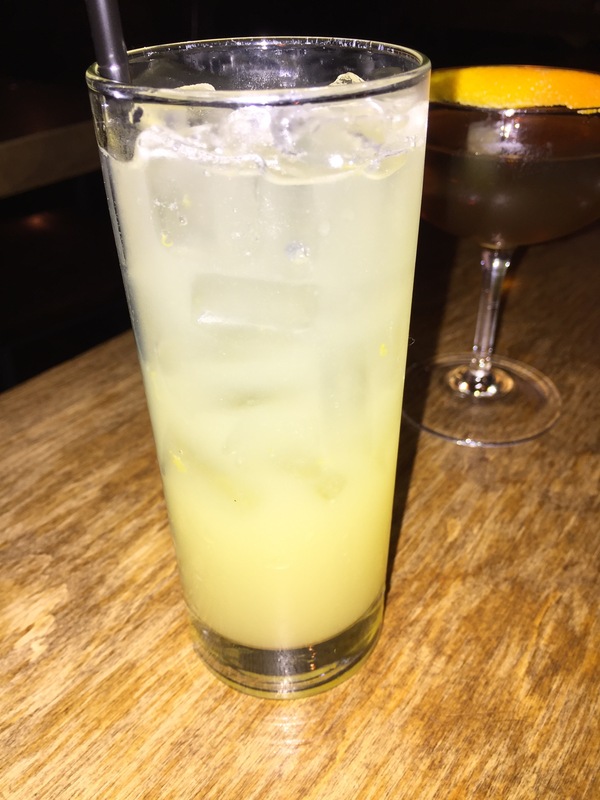 My husband said that this drink was incredibly aromatic from the orange bitters and the orange peel (which I’m sure they also lit before bringing to the table to release the orange oils). This drink was all alcohol, there was no watering down of the drink at all. My husband thought that by adding vermouth to the drink, it made it different and definitely much stronger. He definitely liked the drink. I started my evening off ordering a ginger & meyer lemon homemade soda. Rustic Canyon makes their own sodas and other non-alcoholic drinks rather than using commercially produced drinks. This ginger and meyer lemon soda was bubbly and tangy and sweet and smooth. The meyer lemon gave it that acidic tangy lemon flavor, but the combination with the ginger gave it a bit of a sweet note as well, but finishing off with just a hint of a bite from the ginger. It was such a yin and yang of flavors that just came together so well. 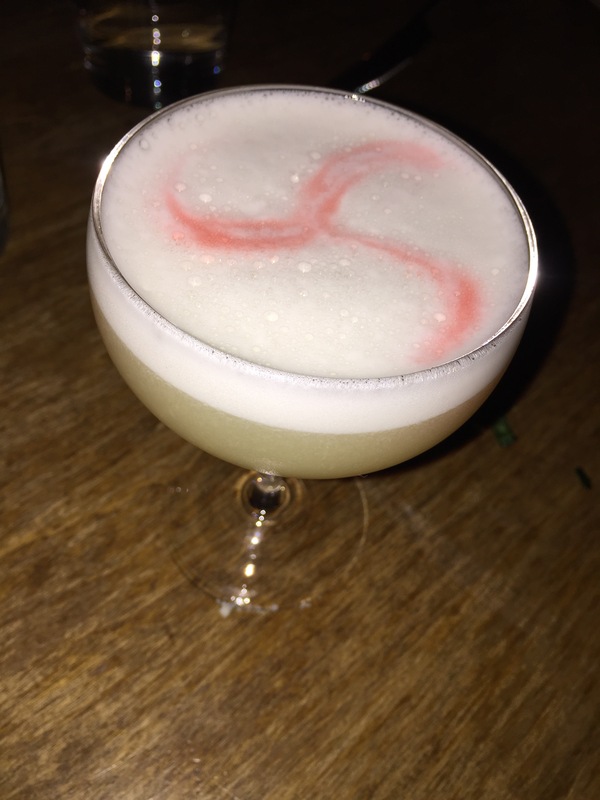 Before the evening was out, my husband decided to order a second cocktail, this time a whiskey sour made with Redemption rye, fresh lemon, orange blossom honey, egg whites and Peychauds aromatic bitters. My husband is a huge fan of bitters in a drink. In the end, he ended up liking this drink better than the Angeleno because it didn’t have the vermouth which he thought just overpowered the Angeleno after a few sips. The vermouth made it taste too much like a martini, which isn’t what he was looking for and it gave the drink an aftertaste that wasn’t that pleasant. With this whiskey sour, this was straight up whiskey, which just goes down smoother and the drink itself was just tastier. After my ginger & meyer lemon homemade soda, I also decided to order a second drink, the non alcoholic Moscow Mule. The drink was good, it was very ginger-y. Definitely more carbonated than the soda I had earlier. It was like more ginger without the meyer lemon that was in the first drink I ordered. To start our meal, we decided to order the 4 cheeses plate served with Milo & Olive bread, preserves and nuts. 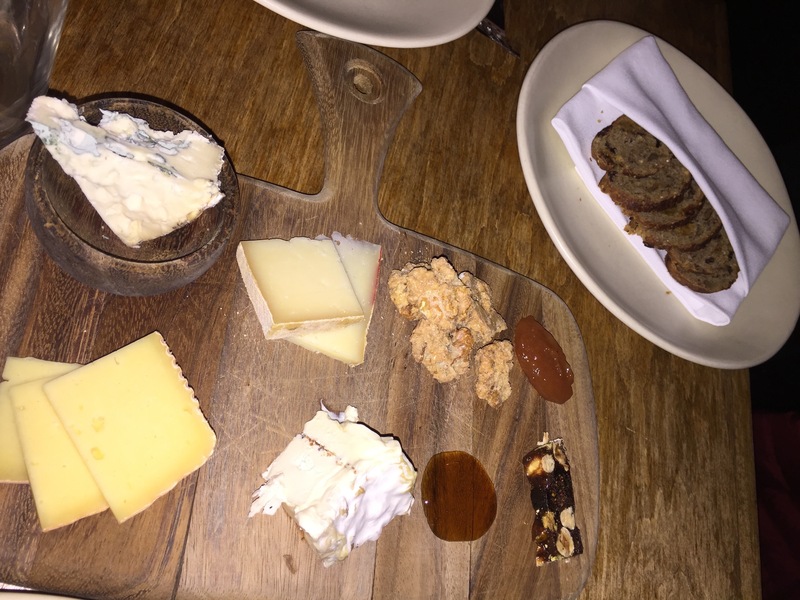 The 4 cheeses were Paulette cows milk cheese, Hanna sheep’s milk cheese, a goat’s milk minuet, and a Bayley Hazen Blue cow’s milk blue cheese. Also served was frosted almonds, honey, quince paste and the Milo & Olive bread was raisin bread. First off, you just can’t go wrong with Milo & Olive bread, and though I’m not a fan of raisin bread, it was actually quite delicious and the raisins were the perfect bread to go with a cheese plate. All of the cheeses were pretty mild in taste and fairly standard. The blue cheese was milder than I thought it would be and was probably my favorite of the 4 cheeses. The frosted almonds were actually quite a nice touch as an accompaniment to the cheese plate as they added a touch of sweetness to the mild tasting cheeses. We also decided to split a salad starter as well before our meals arrived. 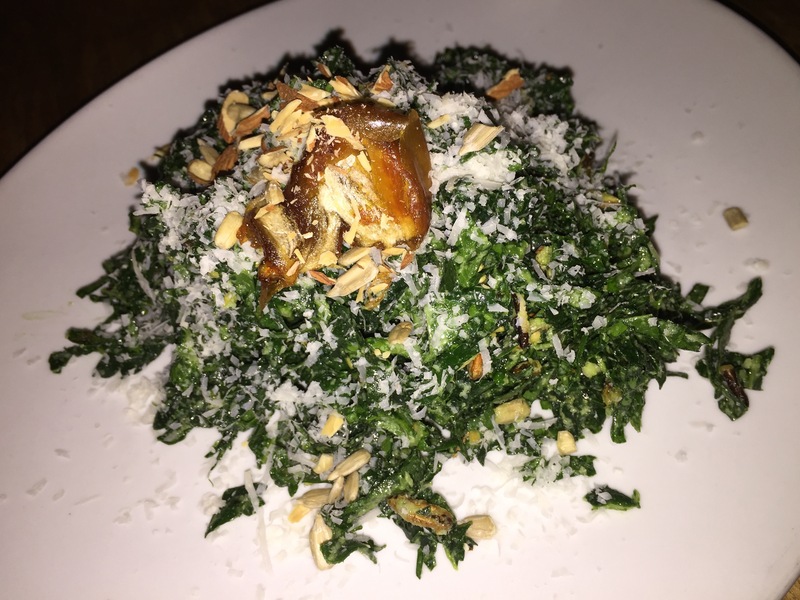 We ordered the kale salad made with dates, Fat Uncle almonds, healthy seeds, puffed rice, parmigiano and lemon. First off, kale salad isn’t the type of thing that my husband and I normally order, but this dish is one of the more popular and well known dishes at Rustic Canyon and since it seemed that everyone else was ordering it, we wanted to see what all the hub bub was all about, so we decided to order it as well. The lemon dressing on this kale salad was terrific, it just gave the kale a subtle flavor of lemon that was needed to punch up the salad. The dates were sweet and interesting, and I don’t like dates, but this was pretty good. The kale itself was fresh and crispy and crunchy. My husband actually said that this dish was in his top 5 dishes he’s ever had, and this coming from a guy that doesn’t really like salads, but for him, all of the flavors just came together. The crunch of the puffed rice and the almonds and the seeds all just added flavor and texture to the salad which was complimentary and pleasing at the same time. The grated parmigiano just added a hint of saltiness and brought everything in the dish together. It was a fantastic salad. For his entree, my husband ordered the flatiron steak served with sunchokes, parmigiano and marrow jus. He requested the flatiron steak be cooked medium rare, and it was done to perfection. The meat was hearty and tender and delicious. I was able to sample a small bit of the flatiron before my husband finished off his plate, and I really liked the flavors of the steak. 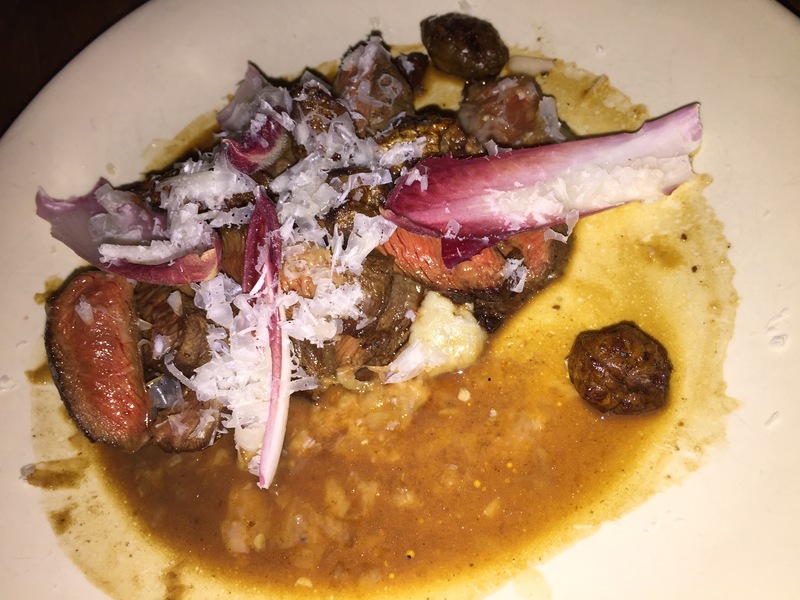 The marrow jus was rich and decadent as a sauce for the flatiron steak and it really elevated the flavor of the meat. This dish was filling and enjoyable and my husband was really happy with this selection. 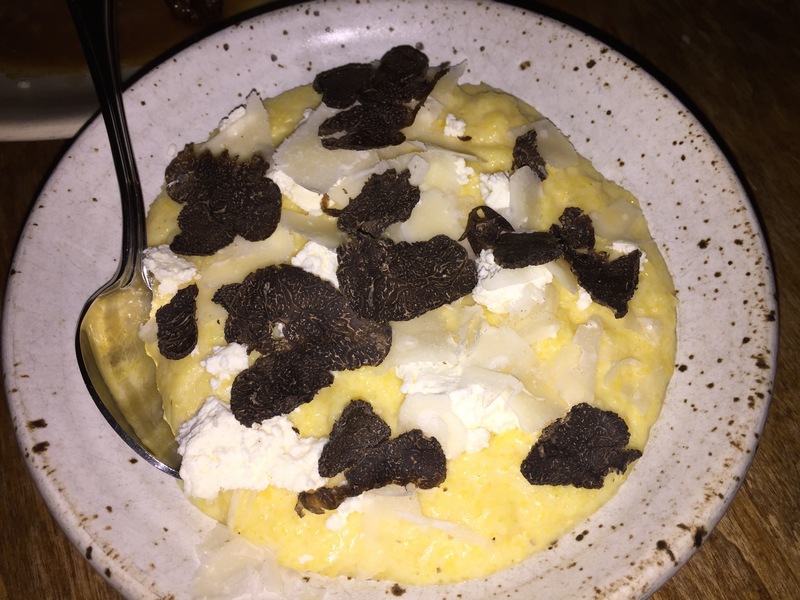 As a side dish, my husband just had to order the Grist & Toll polenta, curds & whey topped with fresh black truffles. If you want to talk about an over-the-top, decadent dish, this is it. The dish was probably already going to be decadent with just the polenta, curds & whey, but holy cow add in the fresh black truffle (and a lot of it!) and this dish is completely over-the-top and my husband was in love. The flavors were incredibly rich that after a few bites, I found it to be too much, it either needed some fat or something acidic to cut through the richness. But my husband was a different story, he loved every single bite of this dish. All he could say was, “wow!” And yet, another dish makes it into my husband’s top 10 dishes he’s ever eaten. 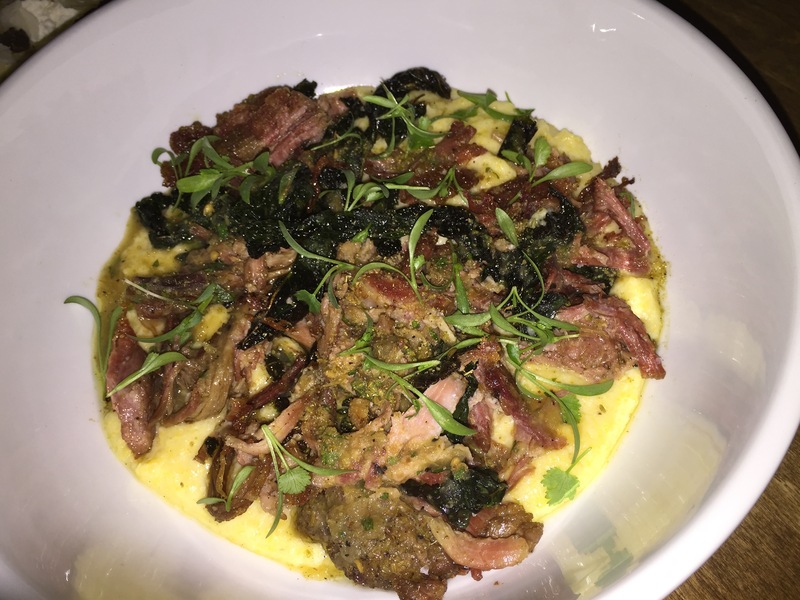 My dinner at Rustic Canyon was the Stone Valley Farm pork shoulder with polenta, kale and green tomatoes. The pork shoulder was tender and flavorful and perfectly prepared. Roasted until it is fall-off-the-bone tender, I was surprised at the large serving size of the dish. The polenta was creamy and rich and well prepared. The flavor of the polenta perfectly balanced the rich, fatty flavor of the pork shoulder. The kale and green tomatoes added another layer of flavor and texture to the dish that helped to balance the whole plate. Rich, creamy, luxurious and decadent are all words that easily describe the complexity of this seemingly simple pork shoulder dish. At this point, I was full, but we couldn’t leave without checking out the dessert menu. Since this was a birthday dinner, my husband encouraged me to order a dessert to celebrate, so I chose the vanilla bean budino. Alright, I should probably listen to my husband more often and thank him because this budino was amazing. Made with white chocolate and topped with pistachio and citrus, the budino had some really different flavor combinations and tastes as well as textures. A budino is essentially and Italian custard or pudding dish, and this vanilla bean budino was perfectly created and flavored. The vanilla bean flavor really shined through in the custard which was a terrific, luscious texture. The addition of the citrus segments really set off the sweetness of the vanilla bean and the tang and acidity of the citrus. And to finish it off, the pistachios added texture and crunch to the dish which rounded out the dessert perfectly and added an earthiness and hint of salt to the flavor profile that just enhanced how amazing the budino was. My husband opted for his own dessert of pear gallette. The pear gallette was served with creme anglaise and pecan crumble and was much larger than I thought it would be. Luckily, my husband was still hungry and the dessert was so good he didn’t have any problems finishing his final course. My husband isn’t much of a pear fan, but he thought that the dish sounded creative and different from your normal gallette, so he thought he’d give it a try. Sure enough, it wasn’t just your normal gallette as it was essentially sitting in a bed of creme anglaise which was just heavenly. The crust for the gallette was fantastic and crispy and flaky, it was even coated in sugar crystals to add a bit of sweetness, plus texture and crunch. The pears inside were hot and tender, but still had some crunch to them. The filling was sweet, but not overly so that it was cloying. But the creme anglaise helped to balance the flavor of the gallette and added a sense of richness to the dessert. 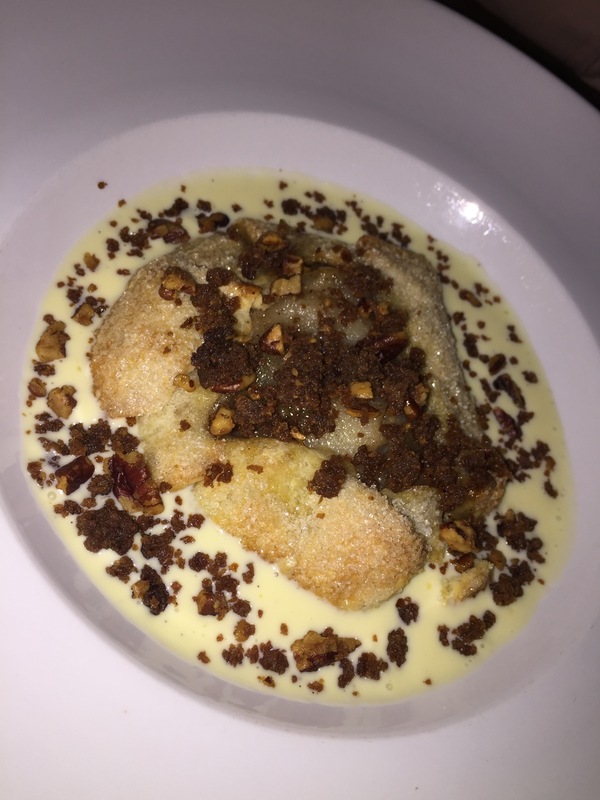 The pecan crumble stole the show though, adding both flavor and texture contrast to the dessert, but also acting as a way to connect the gallette to the creme anglaise as one cohesive dessert. This dessert was massive, but it was so good my husband and I just couldn’t leave any of it behind. As we walked out of the restaurant, my husband said he understood now why after years of having been opened, Rustic Canyon is still considered one of LA’s best restaurants. For my husband, this is now his new favorite restaurant in Los Angeles. Rustic Canyon lives up to all of the hype that comes with the restaurant and its reputation is well earned. The idea of being invited into someone’s casual home to enjoy a delicious, hearty and fresh meal is what comes through when you dine at Rustic Canyon. The food is amazing, and fresh, and local and invokes flavors and combinations of textures that you just wouldn’t have envisioned. Something as simple as a kale salad is transformed into something so amazing with fresh ingredients and flavors that my husband counts it as one of his top 5 dishes ever. That was a surprise to me. The food, the service, the creativity, the inventiveness of the flavors and the ingredients really shines through, and through all of the hype and the pomp, what you really have is a good, clean, delicious food. Rustic Canyon is the epitome of what Southern California cuisine is really all about.